Girish Karnad’s Tughlaq works out its protagonist’s progressive allenation both from the society in which he lives in and also at the interpersonal level from the individuals around him. In a 1971 interview, karnad recalls that Tughlaq struck him as “the most idealistic, the most intelligent king ever to come to the throne of Delhi, indudin the Mughals”, who nevertheless ended as “one of the greatest falures” because of contrucdiction within his personality and the self defeating nature of his politics. The 13 scenes of the play, through closely related to the first two decades of Indian independence, also addresses the emerging amabivalence of power relations in the political and public spheres that were based, for the first time in India, on the principles of mass representation and enfranchisement. The brinaries of the ruler/ruled and the mysterious inner chambers of power politics/the open, public areas of those effected by it form the bedrock of the play, Politically, the play shows Tughlaq’s futile attempts, no be just and liberal toward a majority Hindu population that he is obliged as a Muslim rule to persecute. Simultaneously, the play also uncovers Tughlaq sadistic, manipulative impulses which undercut his image of himself as an exemplary ruler. But he play’s paradigmatic qualities as a historical fiction and its cultural vitality derive principally from the multifold engagement wih hisory, that lies behind the words and funcion diferentially in the processes of “reading” and “watching” the play. 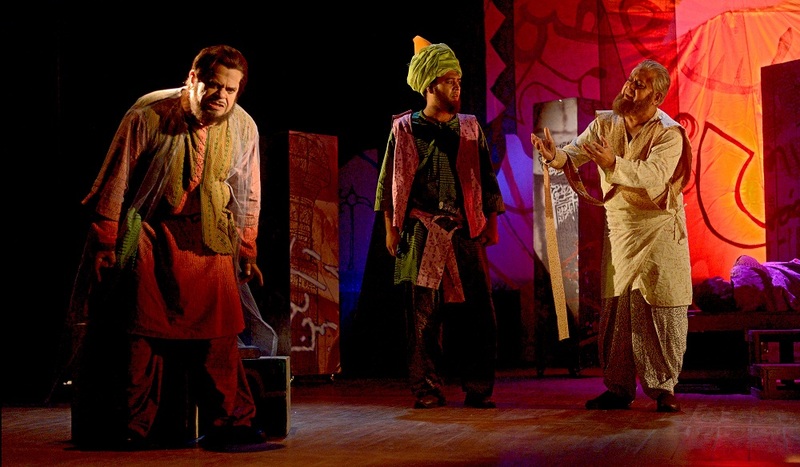 Among the early masterpieces of post-Independence Indian theatre, 'Tughlaq' deserves a special mention for three counts. One, Girish Karnad found a parallel to Jawaharlal Nehru and his failure to live up to the monumental expectations of the people of a 'free' Indian nation. Two, 'Tughlaq' opened up fresh possibilities of interpreting the medieval history which has been vilified along communal lines by the British historians. Three, by authoring a Kannada script and then self-translating into English, Girish Karnad emerged as a formidable authorial voice of post-colonial India. However, it is the continuous of staging 'Tughlaq' over the last 50 years that makes it among the most cherished dramas of modern Indian theatre. Ebrahim Alkazi set the ball rolling with his re-orientation of Purana Qila as the performance site for his NSD production. Alyque Padamsee, Om Shivpuri to Bhanu Bharti ... the illustrious line continues till today. Bengal’s brush with ‘Tughlaq’ is no less exciting. Sombhu Mitra teamed up with Shyamanand Jalan in tumultuous 1971 to stage it. The production bombed! Later on Sekhar Chatterjee and Salil Bandyopadhyay attempted it with varying degrees of success. Now another interpretation of dreams, the delusions of the most remarkable Sultan of medieval India. As the world experiences mass-migrations all over, as the nation finds it extremely difficult to rein the divisive forces, what a dreamer known for his 'madness' can achieve? 'Tughlaq' serves a plethora of problems and a wide range of insights into our times.